MADRIX supports various communication protocols and hardware interfaces. The majority of these communication protocols is based on DMX512. That is why these interfaces will be listed here. ▪ Depending on your hardware interface further configuration may be required. ▪ Make sure to read the corresponding chapter of this user guide regarding the correct output settings. 1] Enable drivers in MADRIX. 3] Choose if you want to use Input or Output. 4] Set up the correct DMX universe. 6] Choose to send optimized frames or full frames. 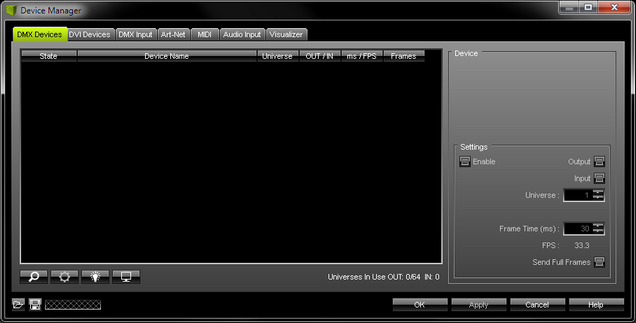 ▪ First, make sure to activate the required USB or network drivers in MADRIX. ▪ The tab DMX Devices will be selected automatically. ▪ A] Enable Output if you wish to send data to this device in order to put it out onto your LED fixtures. ▪ B] Enable Input if you wish to receive incoming data through this device. - Per DMX512 standard, MADRIX only sends the number of DMX channels that is configured. For example, if you are using 312 DMX channels on a DMX universe, only 312 DMX channels will be sent with every single frame on this universe. Highlight - Activates the highlight mode for the selected interface and universe under Preferences > Device Manager... > DMX Devices. Select one or more interfaces and click the button. The corresponding fixtures at the selected interfaces will flash for a better identification or tests. This makes it easier to see them on stage. It considerably speeds up the procedure of programming or testing the selected DMX512/Art-Net interfaces.